Lipgloss & Lashes: Happy Birthday Birchbox! Hello Beauties! I hope you're all well and are having a wonderful weekend, today I'm off for a spot of lunch with my brother in Piccadilly Circus, but before I head out I really wanted to get a post live for you all, as I've been a little vacant on here over the past week. I sometimes struggle to get all my photos taken and posts written now I'm working full time, and this coupled with being a little ill over the past week has just sent me right off my schedule! Anyway, I'm back today with an exciting post for you all...it's Birchbox's 5th Birthday! 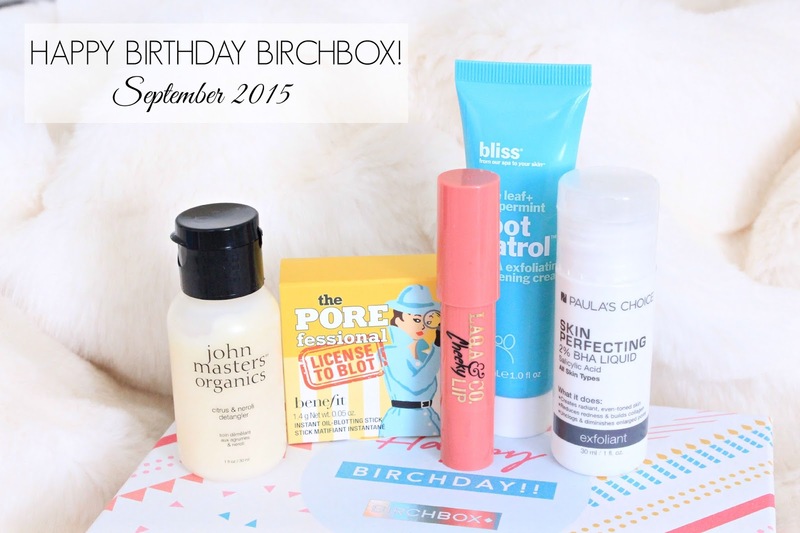 To mark the special occasion, Birchbox have put together a birthday box for all of their subscribers. Mine came through my door the other day with some balloons and cute little party bits and bobs, so today I thought I'd share my thoughts on what I received. 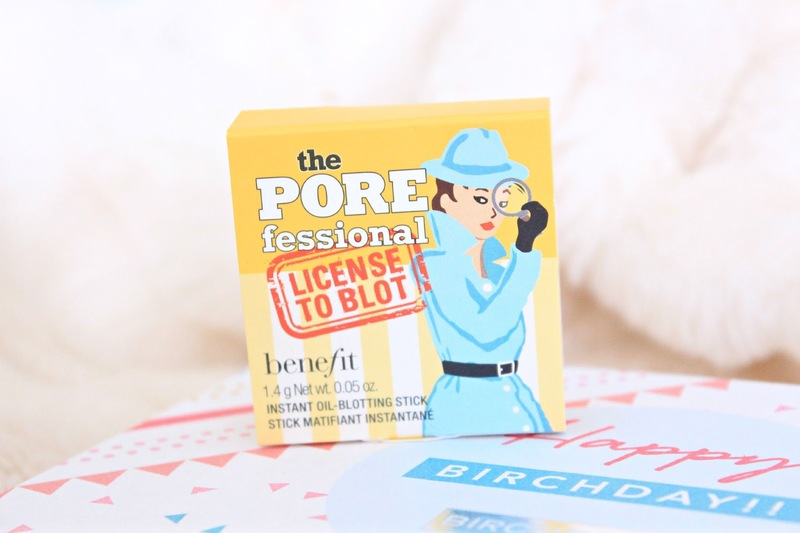 Benefit Cosmetics Porefessional License to Blot Sample - This month Birchbox have treated all of their subscribers to this cute little mini Benefit Porefessional blotting stick, perfect for popping in your handbag. I love the Benefit Porefessional line, so I'm excited to see how I get on with the latest addition to the collection. Plus, it's always good to get a sample of high end makeup before you splash out! Bliss Foot Patrol Exfoliating Softening Cream - I'll be the first to admit that I completely skip my feet in my beauty regime, particularly during the winter as they're always covered up in boots and pumps, however, keeping your feet looking lovely (well, as lovely as feet can look) is something you should all consider. After all, if we all start treating our toes now, they'll be looking fabulous once sandal season creeps back around. John Masters Organics Citrus & Neroli Detangler - The next product I received this month was the John Masters Organics Citrus & Neroli Detangler. This isn't a brand I've heard of before, but as someone with thick and difficult hair, I'm always up for trying out new detanglers. This product can be used either as a wash out treatment, or as a leave in conditioner, so I think I'll save this for my next pamper tonight (probably tonight!). Birchbox Egg Brush - This month's 'lifestyle' product was Birchbox's take on the tangle teaser. I'm not the biggest fan of these brushes as I find the bristles a bit hard on my scalp, but this one is a handy size for popping in my handbag in case of any hair emergencies! 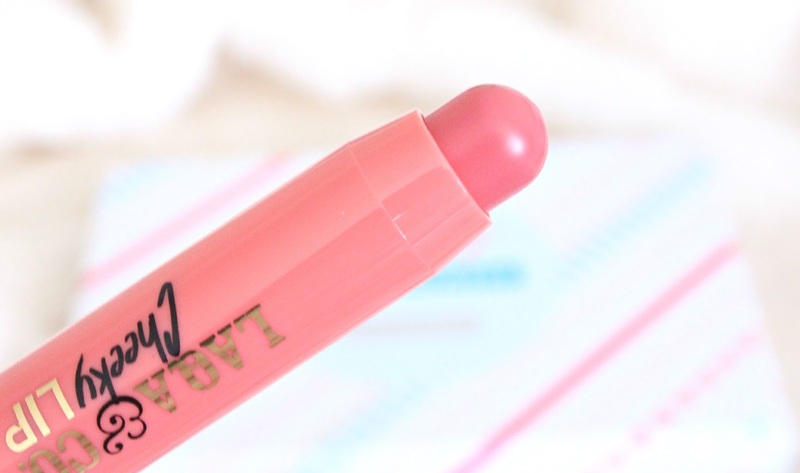 Laqa & Co Cheeky Lip - This month I also received another makeup product in the form of the Laqa & Co Cheeky Lip, which is a chubby lip and cheek stick in this gorgeous rosy pink colour. Once again, the small size of this product will be perfect for popping in my handbag, for touch ups on the go. Paulas Choice Skin Perfecting BHA Liquid - Paula's Choice is a brand I've heard countless american YouTubers mention for the amazing quality/price ratio, however I was unaware that we had access to these products in the UK. I'm a little worried about using this on my skin as I normally get reactions to similar types of products, so I don't think I will be trying this, just to be on the safe side. However, I do think it's great that Birchbox are including some american brands. the Laqa and Co lipbalm looks gorgeous! I might have to give birchbox a go, i've been tempted for a while. I think this box was a good one! I wish I got the Paula's Choice product though. It sounds like such a lovely box, I can't wait to hear your thoughts on the License to Blot as I've heard so many mixed reviews! let us know how the benefit sample works out! Looks like an amazing box!